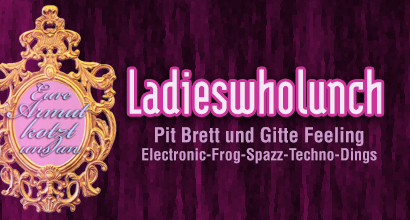 LADIESWHOLUNCH – PIT BRETT and GITTE FEELING (Crome de la Crome, Cologne) presenting: Electronic-Frog-Spazz-Techno-Something. These two platinum ladies have been taking on the world with their eclectic mixes full of debauchery. Prepare for fabulousness!